Today In Crazy Teabaggers - Joe.My.God. The Washington Post reports that teabaggers are going to Colonial Williamsburg to ask the reenactment actors how to best overthrow our socialist Marxist Kenyan dictator. 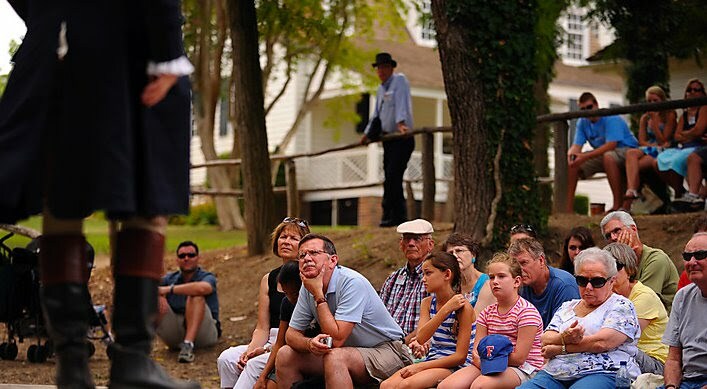 “General, when is it appropriate to resort to arms to fight for our liberty?” asked a tourist on a recent weekday during “A Conversation with George Washington,” a hugely popular dialogue between actor and audience in the shaded backyard of Charlton’s Coffeehouse. Standing on a simple wooden stage before a crowd of about 100, the man portraying Washington replied: “Only when all peaceful remedies have been exhausted. Or if we are forced to do so in our own self-defense.” The tourist, a self-described conservative activist named Ismael Nieves from Elmer, N.J., nodded thoughtfully. I’m going to Bellevue to ask how to overthrow Michele Bachmann. Previous Georgia Gov Candidate Nathan Deal: I Hate Gays WAY More Than My Opponent Does!